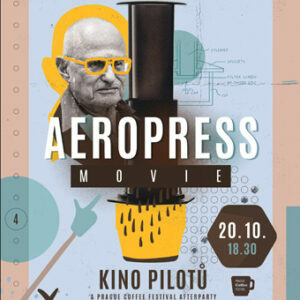 On Saturday, October 20, Prague premiere of AeroPress Movie will take place in the Kino Pilotů cinema. This is the first documentary produced by the European Coffee Trip team from Brno (Aleš Pospíšil and Radek Nožička spent more than a year with it). Original soundtrack was created by Dalibor Mráz. AeroPress Movie is a documentary for all coffee lovers. Millions of people around the world use AeroPress to make coffee. How was this popular helper originated? The central figure of the film is its inventor, 80 years old Alan Adler, who once decided to create a new and better coffee maker in his garage. Thirteen years later, millions of pieces were sold and AeroPress has become a phenomenon. The documentary uncovers the surprising stories of the famous coffee world celebrities who are behind this success. There will be three screenings of this movie in the big hall (each for about 45 minutes). The first screening will start at 6:30 p.m., the second at 7:30 p.m. and the final at 8:30 p.m. The film is in English with Czech subtitles. Ticket price is 120 CZK in advance. We offer a discount of 20 CZK for Prague Coffee Festival visitors. Discount can only be used when purchasing on the spot, not online. You will have to show a valid e-mail with confirmation of payment of the Prague Coffee Festival ticket. Tickets can be booked in advance directly in the cinema Kino Pilotů by phone +420 723 985 986. The premiere is accompanied by the traditional festival afterparty. Musical background will be provided by DJ Hlava whose set will start at 7:00 p.m. The expected end of the event is about 11:00 p.m.